What's better than eating cookies? Coloring and designing them first! Introducing Eleni's New York brand new line of Summer 2016 cookies! Color in the lines or go crazy and push the cookie boundaries! Be part of the popular coloring craze and enjoy the 'sweet' coloring book cookies Eleni's New York designed for kids and adults alike. ELENI'S NEW YORK is proud to introduce its new line of cookies that encourage the inner artist in everyone to color their stress and worry away on pre-designed cookies in the shapes of bears, butterflies, books, hearts and so much more. Show off the edible artwork and then enjoy the cookie as a sweet treat. 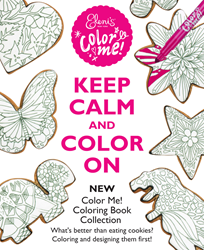 Color in the lines or go crazy and push the cookie boundaries- there is no judging in the world of Eleni's Color Me! "Coloring Book" cookies! Since 1997, Eleni's New York has been a must-stop at Manhattan's iconic Chelsea Market, later followed by an expansive website, where irresistibly designed custom "Conversation Cookies TM" and other treats await for fans located around the world. Today, Eleni's custom cookie creations are a favorite of celebrities, luxury brands, Fortune 500 companies and cookie lovers alike. In addition to the Chelsea Market store and website, Eleni's signature cookies can be found in several retailers located across the U.S. and Canada, including Target, Whole Foods, Bed Bath & Beyond, Crate & Barrel and others. Today, Eleni Gianopulos lives in Manhattan's Upper East Side with her husband of twenty years, Randall, children William & Sophia and the family's two King Charles Cavalier Spaniels, Chester & Lovey. Note: We are proud to state that ALL of Eleni's products are nut-free and our cookies & cupcakes are Kosher certified by the Kashruth division of the Orthodox Union (OU).